Lianshulu Lodge, set on the banks of the Kwando River in the Mudumu National Park in Namibia, offers a true African wilderness experience. 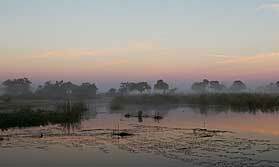 The area is a lush wilderness of forest, marsh and open woodland and is home to an abundance of wildlife. It is most often accessed by travellers from Botswana. Accommodation consists of 12 brick and thatch chalets, each with separate dressing area and en-suite bathrooms with walk-in shower. All have verandas with views across the Kwando River. There are also more secluded chalets, perfect for honeymooners of guests desiring greater privacy. The main facilities include a spacious lounge and dining area, a bar overlooking the river and plains ideal for game viewing, a library and a shop. The lodge also has a swimming pool. Time at Lianshulu is divided between nature drives in open vehicles, boat excursions and sunset cruises on the Kwando River. Guided nature walks are also available. Guests can enjoy night game drives. There is good fishing in the Kwando River. An exciting green season opportunity to visit some of the best wildlife camps in southern Africa at a very special price.